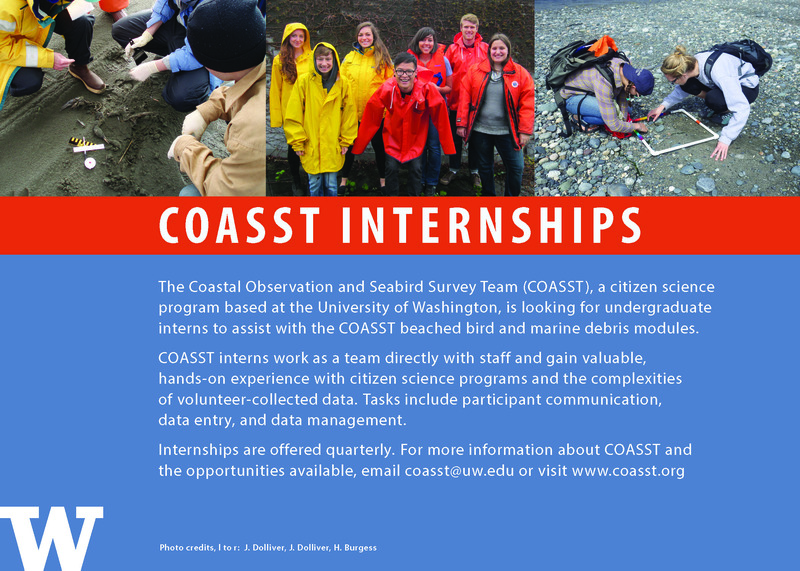 The Coastal Observation and Seabird Survey Team (COASST), a citizen science program based at the University of Washington’s School of Aquatic and Fishery Sciences, is recruiting undergraduate interns for the upcoming academic quarter. COASST interns work as a team directly with staff and gain valuable, hands-on experience with citizen science programs and the complexities of volunteer-collected data. This entry was posted in Uncategorized and tagged Interns on July 18, 2018 by coasst. In late 2015, thousands of common murres began to wash up along west coast of the U.S. and Canada. The highest concentrations were in southern Alaska, where the species breeds in abundance. Reports of sickened and dying birds came in from the Aleutians, from Juneau, from as far inland as Glennallen. In some places, dead murres lay in neat, unbroken lines among the wrack following a high tide, body after body after body. The wreck would continue into 2016. In the thick of it, the Fairbanks office of the Alaska Department of Fish and Game was taking up to seventy calls per day from concerned citizens. Alaska wildlife officials said the murre die-off was the largest in state history. 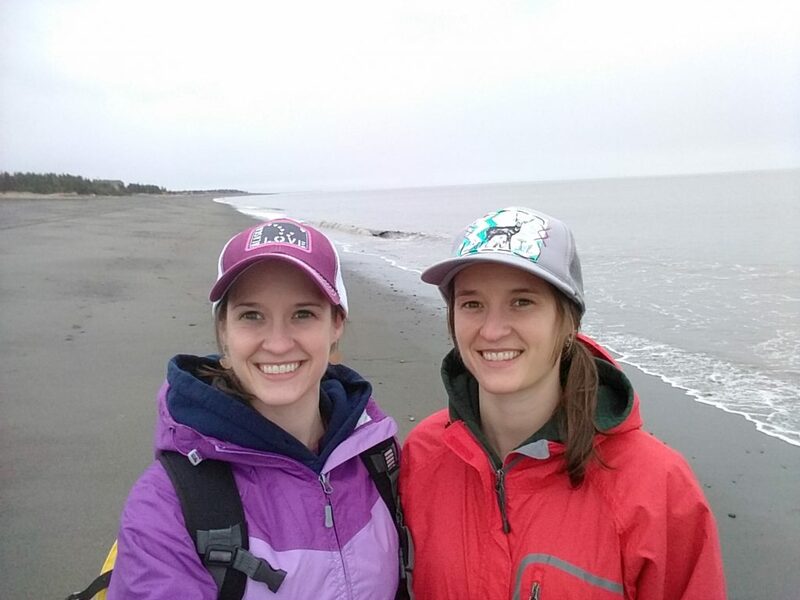 It was in the midst of the wreck, during January of 2016, that Amanda and Mallory Millay happened to be walking along a beach near Kenai, Alaska, where they live. The twin sisters saw their share of dead murres that day, and like everyone else they wondered how widespread the problem was. When they read news articles about the wreck, they often saw, in addition to the expected quotes from government scientists, accounts from people who were part of a volunteer group. 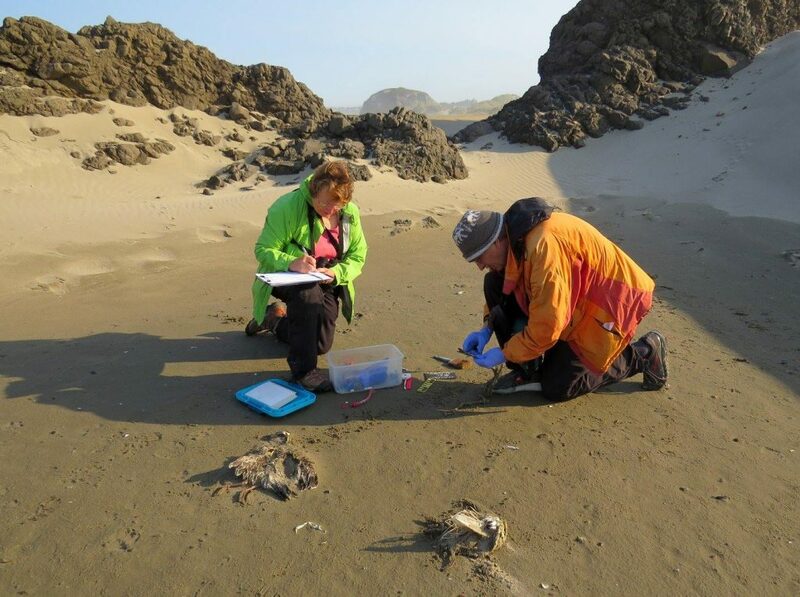 This group sent people out to different beaches once a month to survey for dead birds, and the data these people collected were proving critical to understanding the scope of the die-off. This entry was posted in Participant Profiles on May 31, 2018 by coasst. In addition to writing for COASST from time to time I’m also a volunteer, which means I went to a training, which means that, midway through said training, I watched Hillary Burgess, COASST’s Science Coordinator and the trainer for the day, pull out a big plastic bin full of bird specimens for all of us to practice measuring and identifying. And as I was measuring the chords of variably patterned wings, or examining the webbing between the toes of a foot, I found myself wondering: Where exactly did they come from? 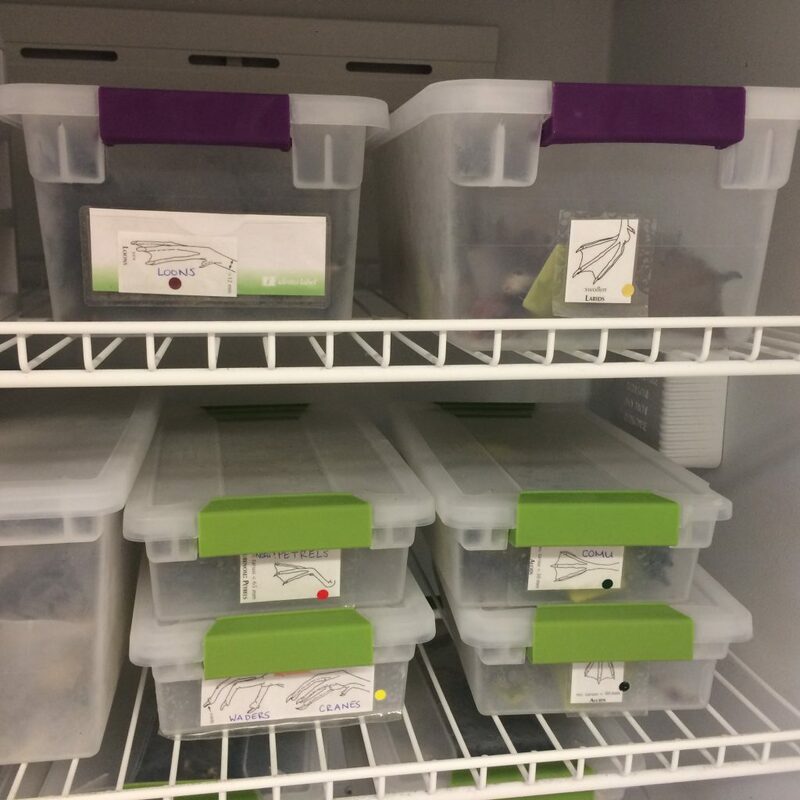 The foot collection, organized by Foot Type Family, occupies a freezer in the COASST lab. As any COASST volunteer knows, the teaching collection is central to their training. But teaching birds get handled and measured, frozen and thawed and frozen again on a regular basis, so their shelf life can be limited. 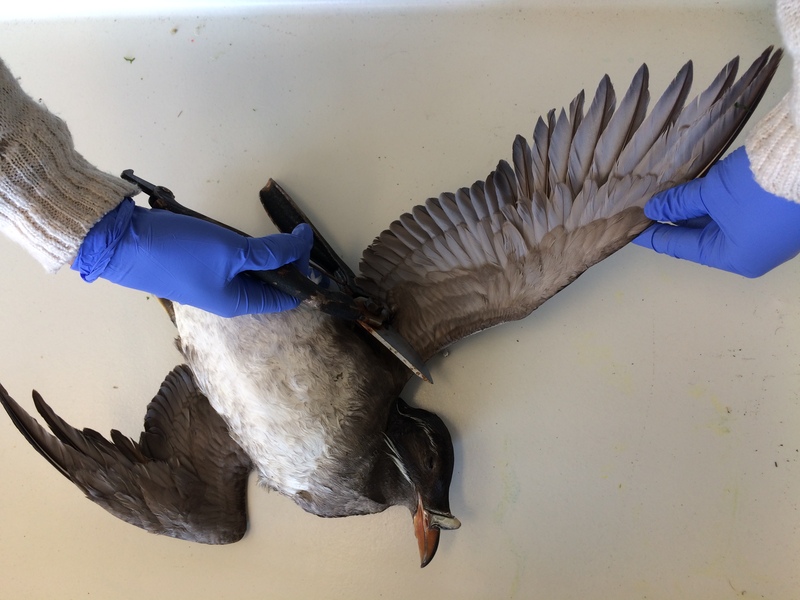 Fresh specimens are needed at a fairly steady rate, and the collection needs to include the range of shapes, sizes and patterns encountered in Beached Birds. But COASST can’t simply repurpose carcasses that COASSTers find on their surveys. Permits are required from the relevant state and federal agencies. So are non-food freezers to keep specimens sufficiently cold. When certain species are scarce, COASSTers have occasionally been added to permits so that they can take on this above-and-beyond task, but COASST also has a network of contacts to whom they reach out. Happenstance rules the day—they can’t just ask the birds to fall out of the sky, Jackie points out—so mostly what comes back are Alcids and large immature gulls. That doesn’t mean there isn’t a wish list of a sort. “We’d really like a Pigeon Guillemot wing,” Jackie says, “but those are surprisingly hard to come by.” A useable specimen must be collected fresh and intact, after all, as if it did just fall out of the sky. On this day, Hillary and Jackie are preparing several Common Murres that had washed up on the beaches of Seattle’s Discovery Park the previous October. With great precision, Hillary and Jackie remove the relevant parts: the wings at the shoulder, the feet just above the ankle joint so the tarsus can be accurately measured. The next step was adapted from processes used to prepare specimens at the Burke Museum of Natural History, a museum on the University of Washington campus that maintains the largest spread wing collection in the world. In fact, Ornithology Collections Manager Rob Faucett has mentored COASST staff and students in the practice of identification, preparation and care of specimens over the years. Hillary and Jackie take the wings and feet to a “setting station” (a large, flat piece of Styrofoam) and carefully position the specimens so that the tarsus and wing chord can be measured, and all the characteristics used in identification can be easily viewed–like number and shape of toes, and any pattern in the secondaries. The specimens will remain here for a few days to fix into these positions, before being labeled according to species and added to the appropriate Foot Type Family or upperwing pattern bins in the freezer. Preparation of a Rhinoceros Auklet wing. A day later Hillary sends me an email. 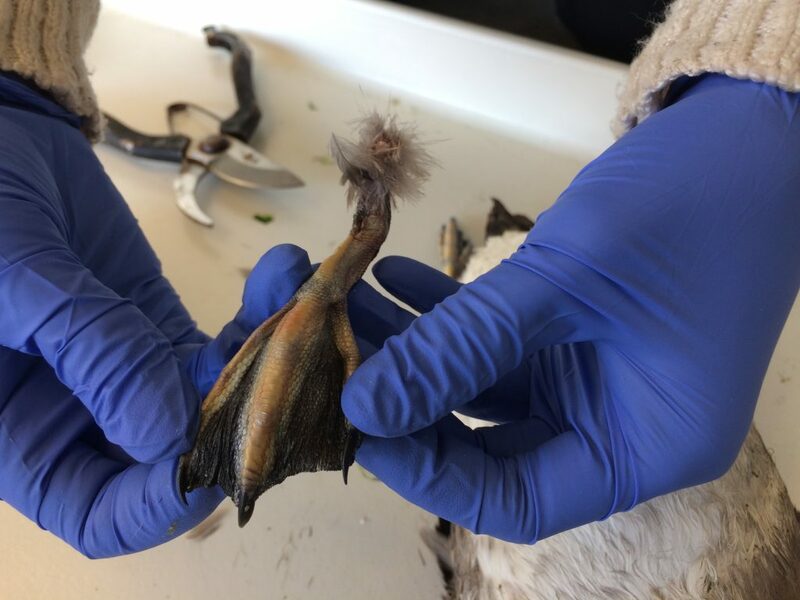 The bird had been found deceased on a beach in Whatcom County, Washington in 2017, but had been banded four years earlier—in the spring of 2013 on the Oregon coast, Clatsop County. The bird was at least six years old. And now, almost dry, it’s feet were ready to take their place in a bin on a shelf in the freezer, to become objects of a different COASST fascination: examples of feet with four webbed toes. 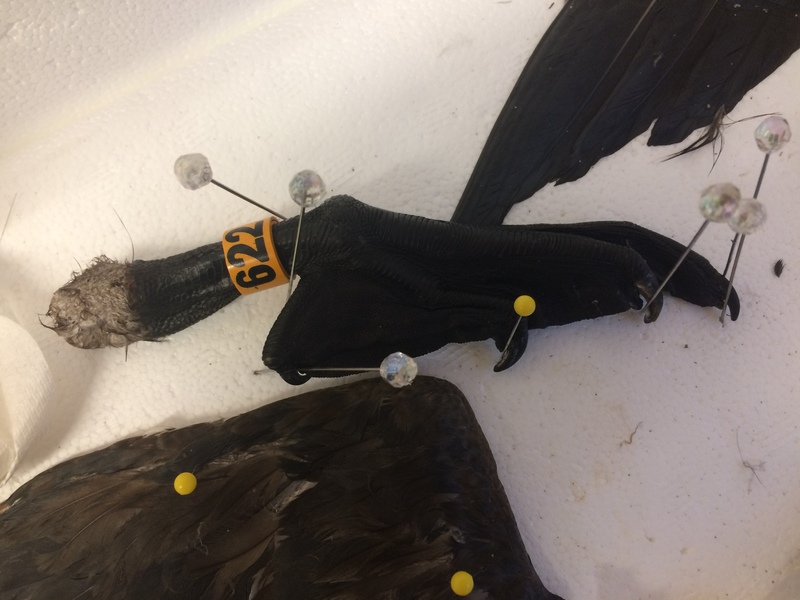 Pinned into position so that all four webbed toes can be easily seen, this banded cormorant foot has a story to tell. 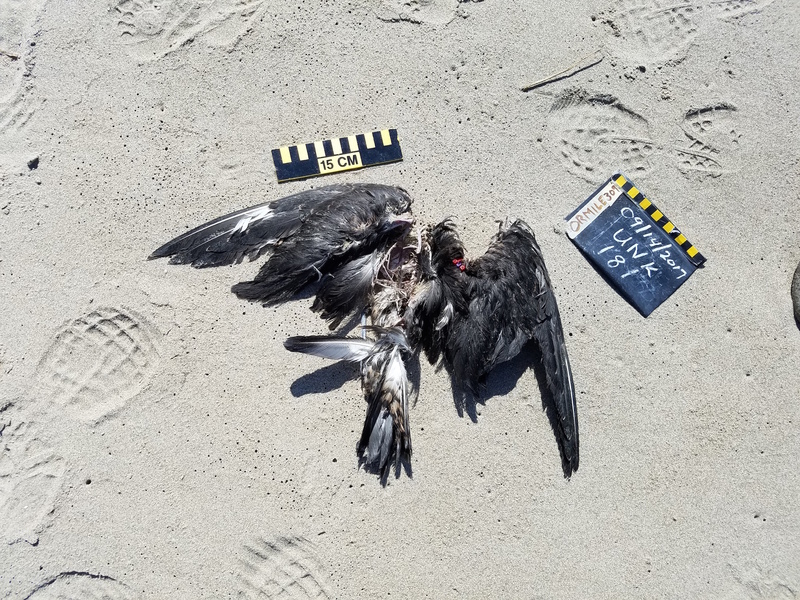 This entry was posted in Beached Birds, Uncategorized on May 3, 2018 by coasst. Flip through any calendar devoted to Oregon landscapes, and you can be reasonably certain you’ll find somewhere in it a picture of Haystack Rock, usually backlit by a glowing sunset. The 235-foot-tall basalt coastal monolith presides just off of Cannon Beach. With its extensive network of tide pools, as well as the large seabird colony that calls it home in the summers, it is one of the more popular tourist destinations in the state. But there are actually three official Haystack Rocks along the Oregon coast. One of them happens to be a bit farther south, just offshore of the town of Bandon. Admittedly not quite as picturesque as its northern namesake, this Haystack is 105 feet tall, tabular, and inaccessible from shore. 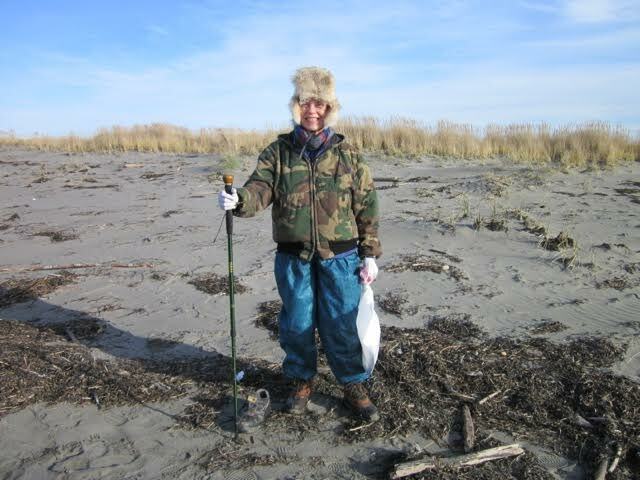 It is, however, the Haystack that marks Diane and Dave Bilderback’s survey beach: OR Mile 99. This entry was posted in Participant Profiles on April 10, 2018 by coasst. What do the following things have in common? 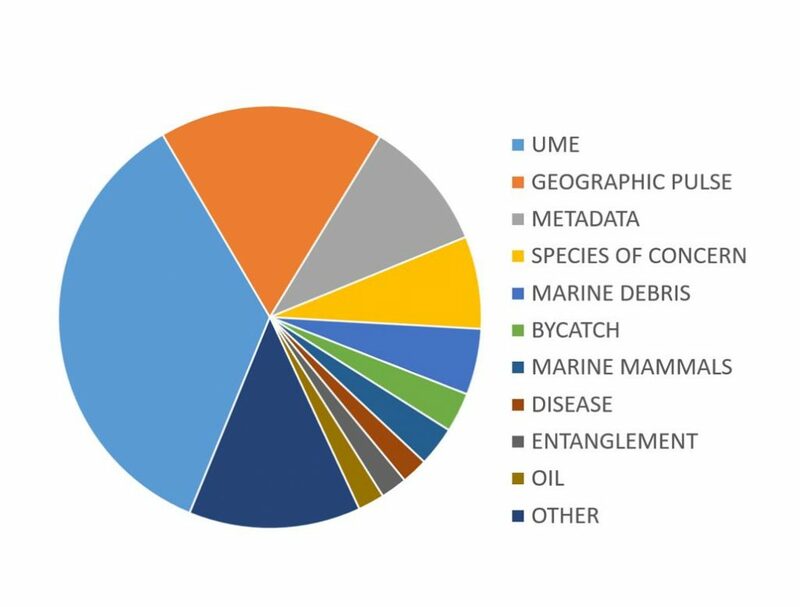 A global database of derelict fishing gear wildlife entanglement data. They are all uses of COASST data — and the list goes on! Data are summarized and appear in outlets that range from reports, to peer reviewed publications, to media articles. From 2008 (when we started keeping track) to today (Feb 26 2018), 207 requests for COASST data have come to the office. 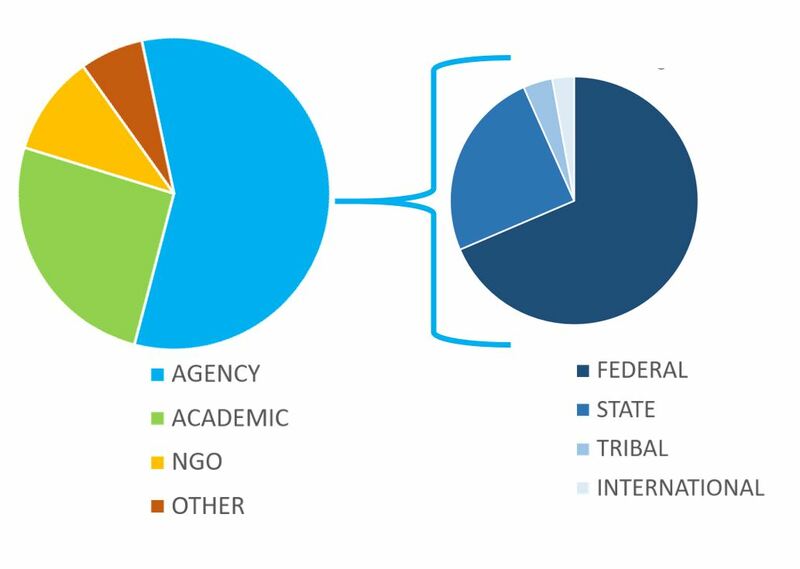 Most requests come from partners at resource management agencies like the National Oceanic and Atmospheric Administration, United States Fish and Wildlife Service, National Park Service, and the Washington Department of Fish and Wildlife, but we also hear from academic researchers, non-profit organizations and the media. Most of the 207 requests for COASST data have come from government agencies. Of those, the majority are federal partners. Although the beached bird program was designed to generate a baseline against which the impact of catastrophic events, such as oil spills, could be measured, there have been myriad other uses of the high quality information that COASSTers collect! Of course, the most common use of our data is in defining, tracking, and explaining deviations from the “normal” pattern of beached birds at specific times and places. With a serious uptick in frequency and magnitude since 2014, die-offs are keeping all of COASST busy! So how are COASST data used in “real time”? During an unusual mortality event, COASST keeps the pulse coming in from surveys and anecdotal reports, and provides regular updates to the agencies with jurisdiction over the affected species and locations. 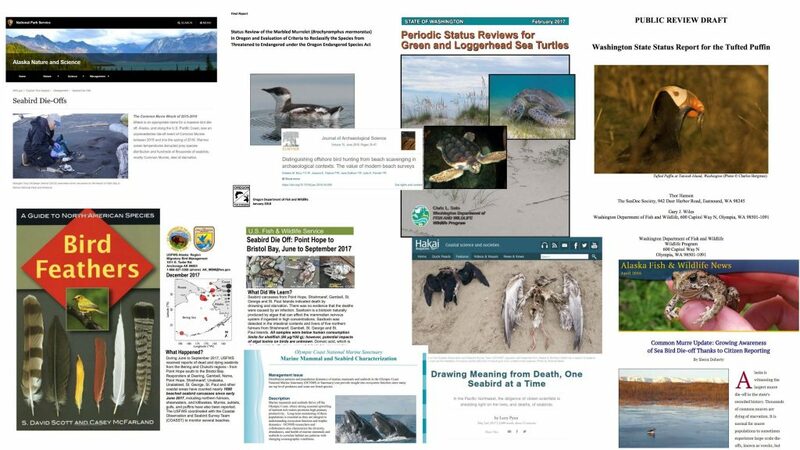 These agencies make decisions about things like whether to collect carcasses for necropsy, closure of public lands, and hunting/harvesting of seabirds and their eggs. Collectively, we pull together the puzzle pieces as they unfold: Where, when, who and how many birds? Do we know why they died? What precautions should be taken? Are there other unusual things happening in the ecosystem at the same time? We attempt to answer these questions, and collaboratively craft the fact sheets that wind up on our respective websites. COASST surveys are a valued and varied source of information. If you find yourself wanting to know more about how COASST data are used, be sure to check out COASST Stories. 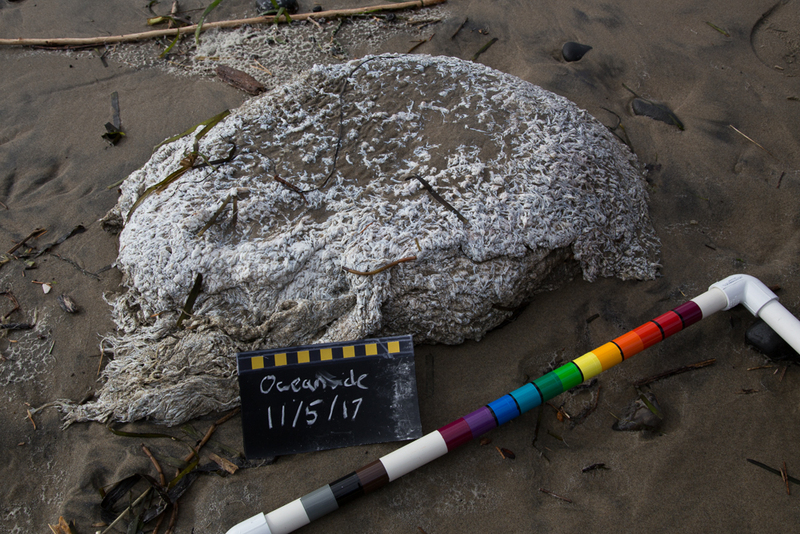 A note to our intrepid marine debris participants: it takes some time to gather enough data to detect patterns and uncover stories. Because this program is so new, we’re just starting to be able to do these things, and plan to feature what we find very soon! This entry was posted in Uncategorized on April 3, 2018 by coasst. Can you help us identify the following mysteries from recent COASST surveys? 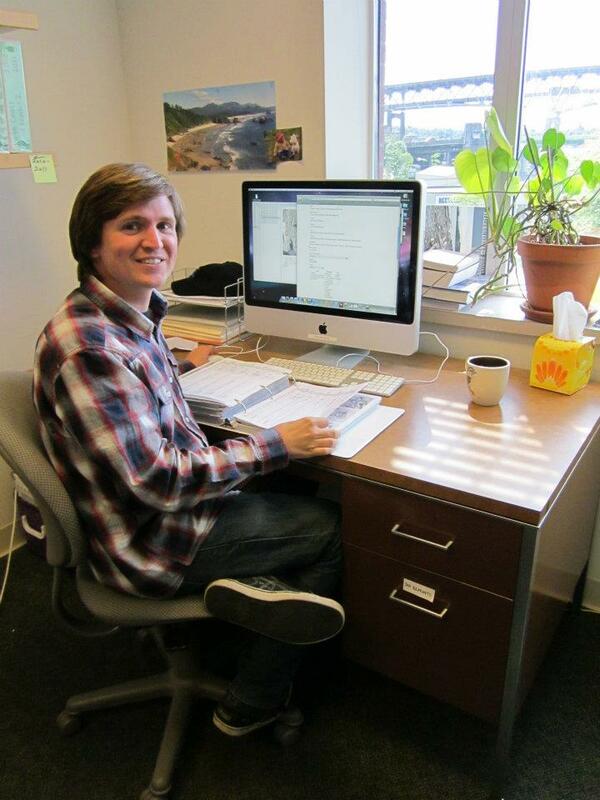 Leave a comment here, or reach out to us at coasst@uw.edu. 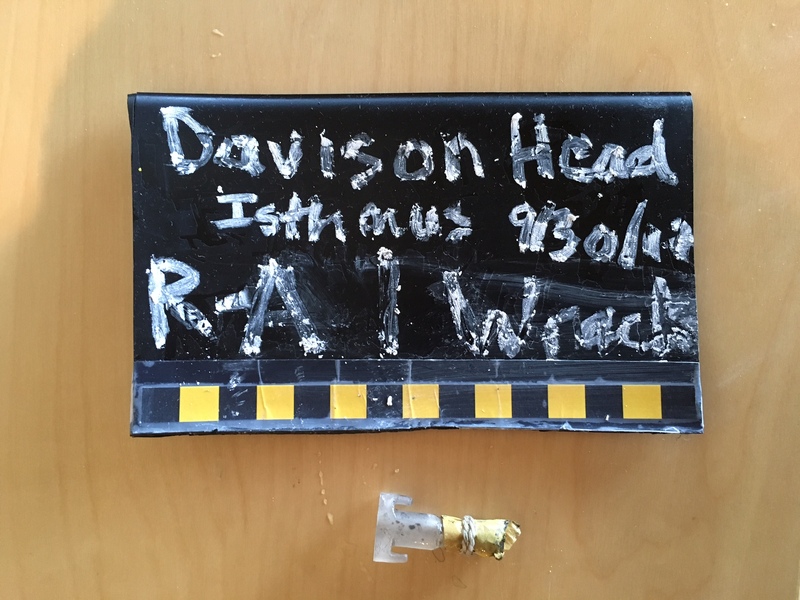 Ruthanne and Harry found this item a year ago on Cliff Beach — it just caught our eye! 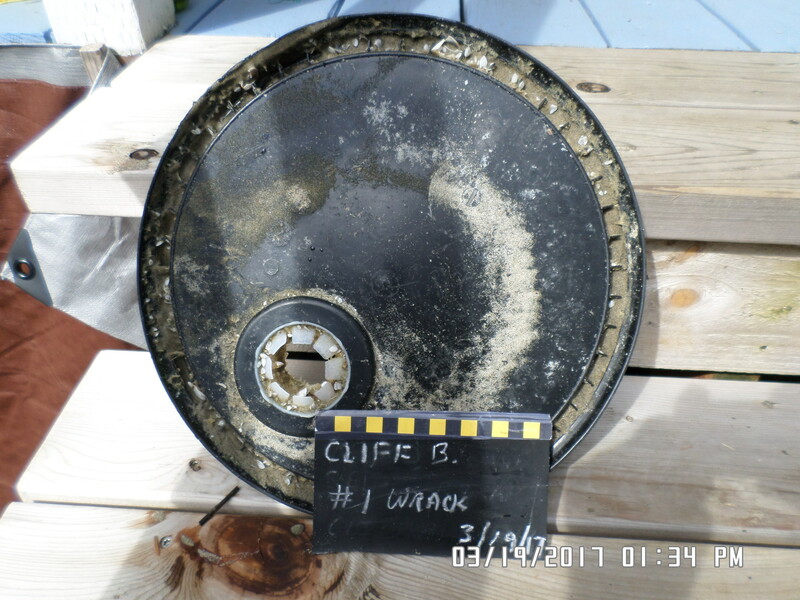 This item was found by Sandy during her large marine debris survey of Hastie Lake Rd. S in January. It is 59cm across. In Jeanne Finke’s kitchen sit a pair of binoculars and bird guides, which she tends to reach for, as she says, in the way others might reach for salt and pepper. For Jeanne, they are just as necessary. 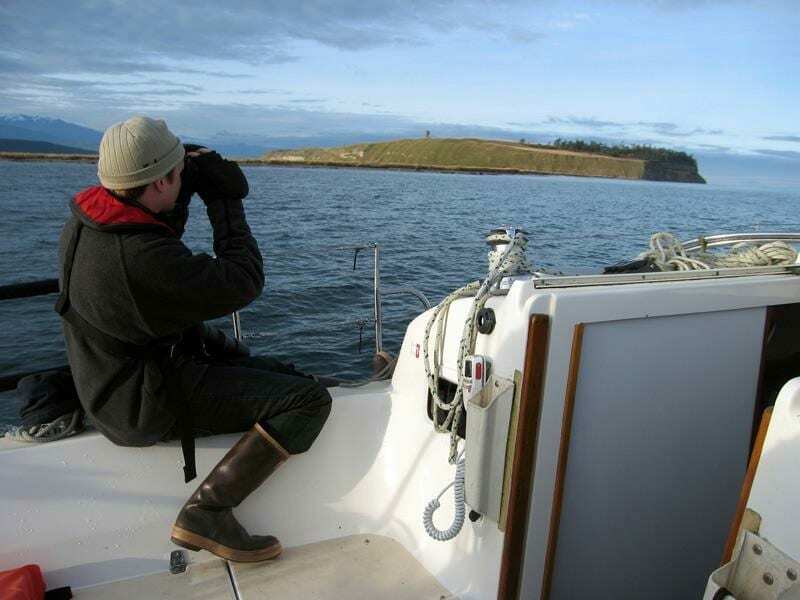 She lives on the North Bay of Grays Harbor in southwest Washington and sees birds through her window all the time—pelagic birds, shorebirds, the latter sometimes in great numbers during migration. She’s taken classes on bird biology and feels she has a good handle on her local avifauna, but she’s always curious to know more about what might be around, whether in view or out of sight, living or dead. Jeanne Finke on survey in December 2017. Photo credit: Susan Kloeppel. 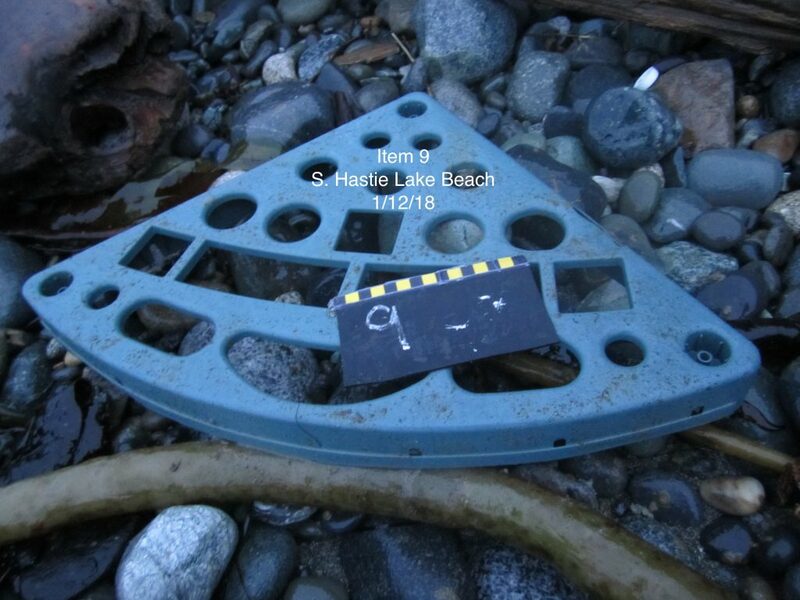 This entry was posted in Participant Profiles and tagged beached birds, citizen scientist, Marine Debris, Ocean Shores, Washington on February 21, 2018 by coasst. Marine debris COASSTers Jenny and Jesse encountered this “Big gooey blob that could not be pulled apart (Stunk!!! )” during their November survey of Oceanside. Do you know what it is? Please post a comment here or send a message to coasst@uw.edu. 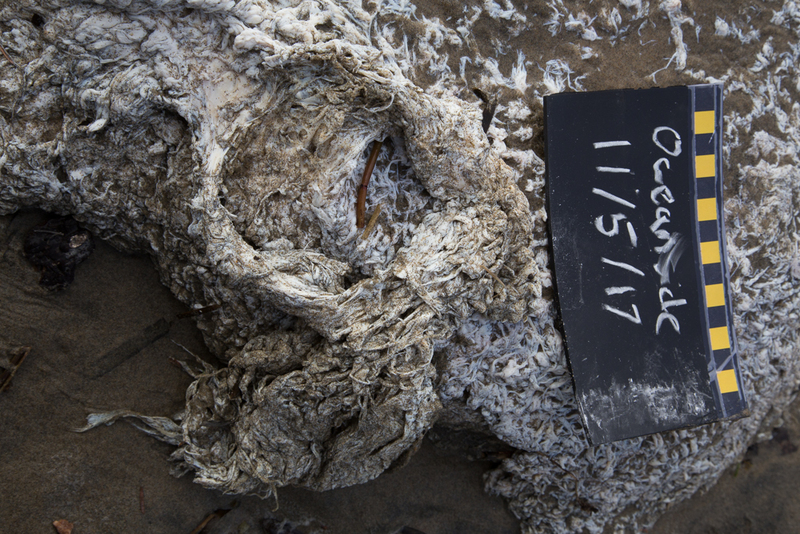 This entry was posted in Marine Debris, Unsolved Mysteries on February 1, 2018 by coasst. 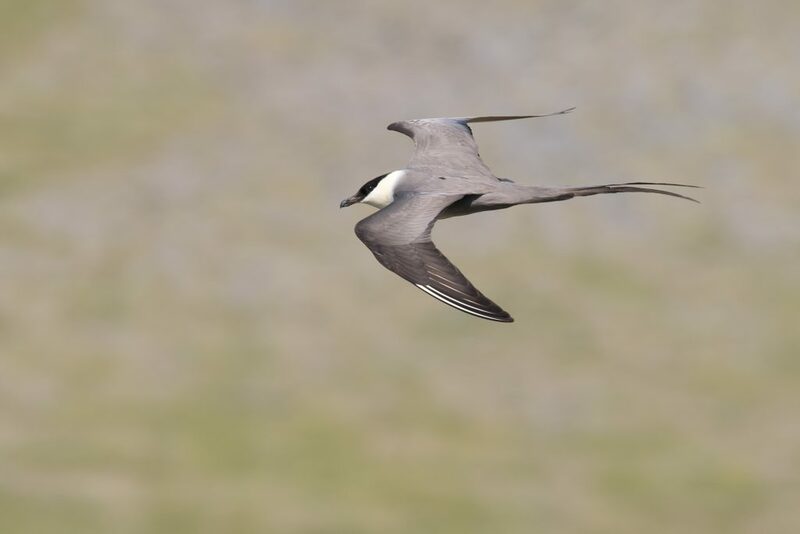 In September last year, our data verifier Charlie got quite excited about the Long-tailed Jaeger found by Margaret and Nancy on Oregon Mile 309. This bird is so rare in the COASST dataset, it’s only the second one COASSTers have found in 18 years of searching the beach! Typical measurements – Tarsus: 34-46 mm, Wing: 29-32 cm, Bill: 26-31mm. In the same family as gulls and terns (Larids), jaegers make their living swooping in and stealing prey from less agile fliers. And the long tail? Just an ornament, rarely seen outside of the breeding season. An easy way to tell a Long-tailed from the other jaegers? Check those outermost primary feathers: 2 bright white feather shafts in Long-tailed, 4-6 in the other species. Photo Credit: Lucas DeCicco/USFWS. We tell you a lot about the birds frequently found by COASST: at over 24,000 finds, Common Murres are comfortably in the #1 spot on our species list. And the top 5 species (Common Murres, Northern Fulmars, Cassin’s Auklets, large immature gulls – we know that’s not a real species, but still! – and Rhinoceros Auklets) account for an astonishing 71% of the 68,700 marine bird finds to date. But what about the rarely found birds? 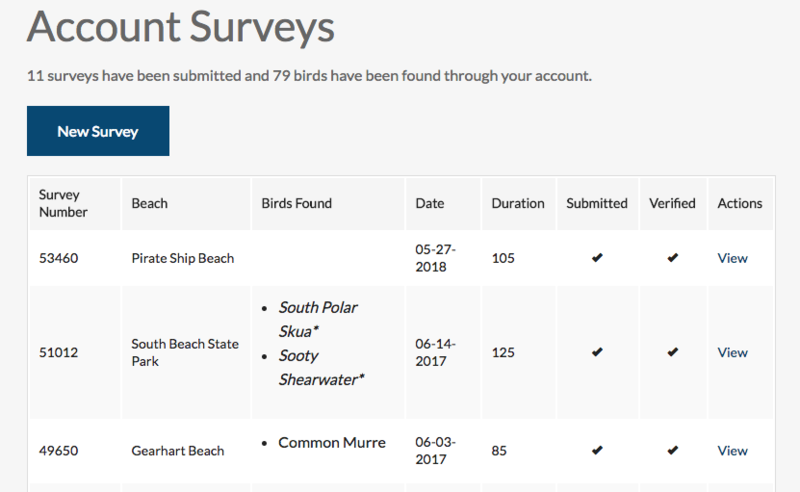 This entry was posted in Beached Birds and tagged Citizen Science, rarities, Seabird on January 16, 2018 by coasst.